Yoga and meditation are related to each other. In yoga, the person has to perform various exercises (Asanas). Although you must sit or stand in one place while practicing yoga, you may feel tired and your body may sweat after a yoga session. There are several Yoga asanas that require users to keep their eyes closed. Meditation is all about relaxing the mind without exerting pressure on body organs. It can help you sleep better and get rid of anxiety. While meditating, a person must keep his eyes closed. Calm is the most popular meditation app for IOS and Android OS. The app helps you sleep better. It also relaxes your mind with eye soothing animated images, mood refreshing stories, and breathing exercises. The Calm app downloads the animations and audio files when you connect your phone to the WiFi connection. 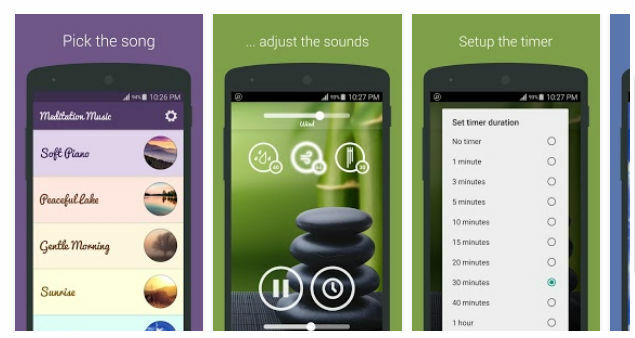 The app features several meditation sessions. The sessions last for up to 10 minutes. Initially, only the first session is unlocked. You must unlock the remaining sessions by completing the preceding sessions. Calm maintains a history of your meditation sessions. If you haven’t used the app while meditating, you can add session duration, time and date manually. The Calm app provides a reminder utility so that you can schedule reminders and meditate daily. Calm provides an option to sync data with Google Fit. You can configure the app to download files over WiFi or Cellular data connection. If you’re using this app on a low-end phone, you can disable animations from the settings panel for a better experience. Calm allows you to turn on the airplane mode (offline mode). If you turn on this mode, this application will download files having size up to 2GB. Want to relax your nerves and overcome anxiety? Want to sleep better? Try out the free Headspace app. HS is a top-rated meditation app that teaches you simple yet effective meditation techniques. Headspace is suitable for beginners. 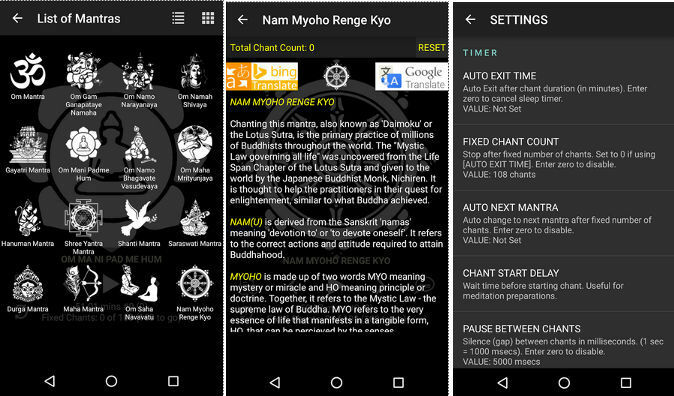 People who have been meditating for a while can also use this application. 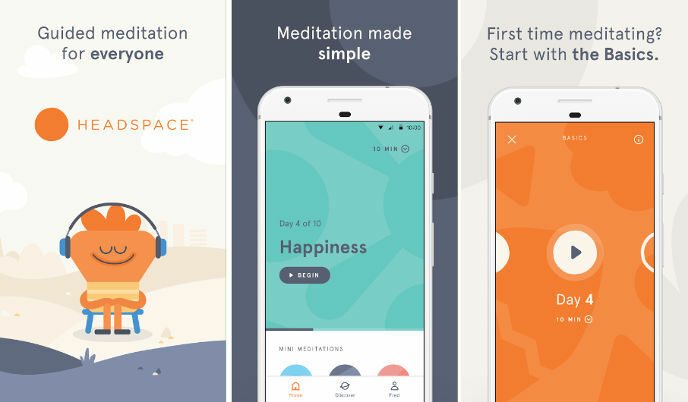 Headspace features many short and long duration voice-guided meditation sessions. Short sessions last for up to 3 minutes. Longer sessions last for 10 minutes. Headspace allows you to discover new styles of meditations. If you can’t meditate right now, you can set a reminder in the Headspace app so that you can meditate later in the day or tomorrow. This application has a timeline section where you’ll find your daily goals and details of your previous sessions. If your friends use Headspace, you can follow them and see their progress. Chanting mantras is one of the most effective ways of meditation. Mantras not only brings a person closer to God but it also helps in relaxing the body. This app features several meditation tracks. You must select a track which you find easy to chant. Once you do so, the app begins playing the track and at the same time, it displays the duration for which the app has been playing the track. The app has the option to add tracks in the person’s native language. Meditate makes you aware of the meaning of the mantra you’ll chant. It pauses the track automatically when your phone receives a call. This application enables you to set a background picture for the main interface. It also lets you change the color theme. You can configure the Meditate app to play a track repeatedly or for a fixed duration. The MM app from Relaxio gives users access to nerve calming high-definition music files. Users must select a file from the list and set the time for which the app should play the file. Once the app starts playing the file, you can sit in an upright position and close your eyes or lay on the bed. Unlike the 1st two meditation apps on our list, MM doesn’t ask you to register an account nor does it download additional files from the web. Apart from music, this app sets a beautiful HD wallpaper as a background image for the inbuilt music player. The BMT app enlightens your mind by displaying motivational quotes. When a quote is loaded in its interface, BMT plays a sound file for a duration you specify. You must focus on the quote and repeat it silently until the music stops playing. 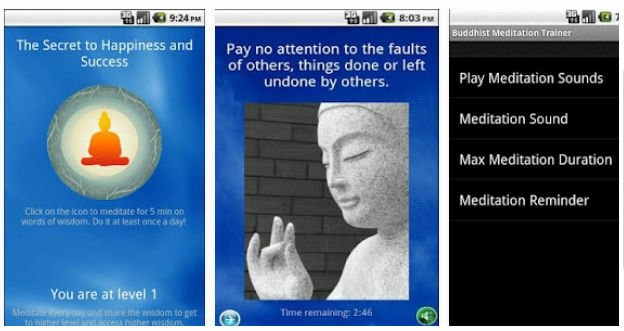 The Buddhist Meditation Trainer app has several quotes categorized in different levels. The quotes and the music get better when you complete a level. BMT improves your concentration. It also inspires you. It is the smallest meditation app on our list. 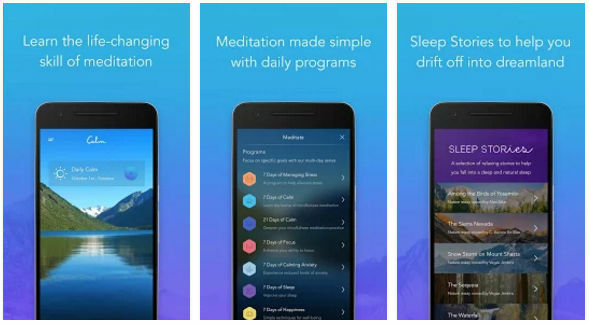 Conclusion: If you’re unable to concentrate on work or you can’t sleep or focus on studies, install and use one of the meditation apps we’ve mentioned above. If used correctly, these applications can reduce your stress and kill anger. They can also motivate people who are going through a rough patch.